With the help of our team of experts, we have been able to bring forward for our clients a superior quality range of Scalping Cutters. The entire range is made in compliance with the international quality standards, by our team of talented & skilled experts. We also make sure to timely deliver Scalping Cutters at the customers' premises in perfect packaging. 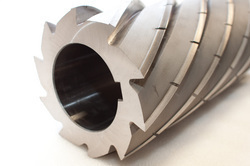 Our product range comprises Gear Hobs, Gear Shaper Cutters and Broaches and Spline Broaches. Scalping cutters and slab milling cutters are used for scalping copper and brass strips. Some scalping cutters used for milling of plain surfaces of ferrous as well as non-ferrous metals. We are one of the eminent names of the market engaged in offering a supreme quality range of Scalping Cutters to the customers. These Scalping Cutters are highly demanded in the market for their effective usage in scalping copper and brass sheets and strips. With our large production capacity, we have been able to meet bulk as well as urgent requirements of the clients efficiently. Looking for Scalping Cutters ?